The configuration of the USA New Wall, as people have begun calling it, is based largely on configurations I've observed while studying Swedish factory built houses. The Swedes house building is based on stud framed walls similar to ours, but they have spent the past 30-40 years slowly improving the performance and efficiency of their techniques. As such their stud walls today are an evolution of the crude and inefficient walls we commonly build in the US. Its an ideal model for what our industry should do to improve our building. I intend the USA New Wall to be a guide for how to do that. Our construction materials and practices are slightly different, so we can not copy them directly. You might say we need to translate. One of the issues that needs to be considered is the climate zones. 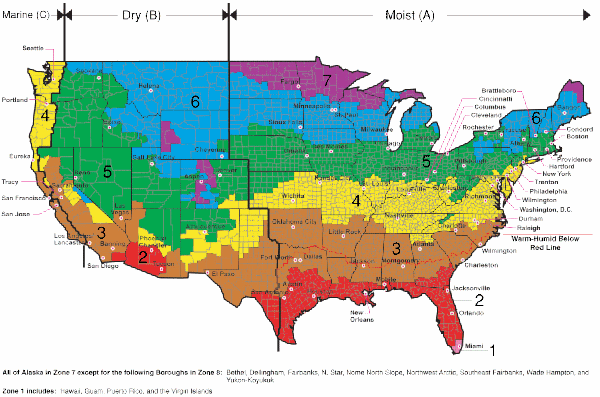 I've begun with a heating climate wall, but in the US Department of Energy divides the country into seven climate zones, the coldest being zones 6&7. Sweden being a much smaller land area does not have this range, and in fact is probably most similar to our zones 6&7. In the US our Zone 5 covers a great deal of area and is a lesser heating climate, and is likely to almost always have air conditioning for summers. In the US we can find air conditioning in Zones 6&7 as well, but in Sweden this would not be the case. Air conditioning of course changes the vapor profile of the wall in the summer months and requires a different response in the design of the wall. So we need to extend the Swedish model so to speak, to make configurations appropriate to climates that don't exist there. This is the work that I've been doing since January, and I have profiles for walls in zones 4,5,6, & 7 worked out. I am still considering the best way to document these and where and how to distribute them. I will start with discussing them here in the blog in upcoming posts. I'd love to know what wall system you would devise for Hawaii. I think there is really nothing special to do for Hawaii. Most houses are uninsulated. Roofs are encouraged to be insulated to discourage the sun overheating them during the day. Air-conditioning may be desired for some, but I suspect most do not require it. More of a challenge there will be preventing your wood from rotting. I have a question for you Greg. How tall of a building can you build with these Swedish type wall systems? Up to 5 storeys? Higher? And do you think that the Cross Laminated Timber CLT wall systems are better? Wood frame houses are typically limited to 2 or 3 stories. For other building types see your building code. I think the Cross Laminated Timber CLT is a totally different thing, not better nor worse, however certainly much more expensive for homebuilding than conventional stud framing. In the US at least. Well... Actually wood framed STRUCTURES are limited to 5 storeys as far as I know. Got my info from wood framed structure earth quake studies and codes. I was trying to find out if you could use the Swedish wall construction to ACTUALLY build a five level building - or a 3 or 4 level one. Thanks. Since you mentioned Bensonwood, I'd be interested in your comments on their R35 OBPlusWall systems. I think I would prefer the Roxul product in your wall system. The I-joist in BW's wall probably(?) reduces thermal transfer more than the 2x6's or 2x8's in the USA New Wall. What is your opinion on their vertical furring strips tied to a base chase versus horizontal furring strips for running eletrical? Finally, when will we see your Plat House offered by Bensonwood? Yes, I know the OBPlus wall very well. First you have to understand that these walls are at different purposes. Bensonwood is building just about the best wall you can build starting with a clean sheet. The USA New Wall on the other hand is about an easy transition for conventional builders to making a higher performing wall. So what is going on with the OBPlus - Yes, they use an I -Joist stud to reduce the thermal transfer thru the stud. But its also 9.5" deep so that allows them to fit even more cellulose into that insulation cavity. The have an interior and exterior layer of Huber's Zip sheathing for a balanced vapor profile to the insulated chamber - this means it wets/drys to both sides at an equal rate - and it also makes for an incredibly strong wall. And as far as their vertical furring, yes, because of the additional depth of their stud they don't rely on the electrical chase as a thermal break, nor do they insulate it. Their wiring chase at the baseboard gives their houses long term flexibility. Things can be rewired or updated easily without poking wires through your insulation layer, or upsetting the bulk of your finishes. This represents a very long view to the life of a house, and its at the heart of their philosophy. These are great features, and all ways that Bensonwood builds more value into their wall. As for the Plat House, Bensonwood's people are working on it right now and in a couple of weeks we'll probably make a formal announcement that its available.